Oktoberfest is right around the corner so it's time to start brewing your Fall beers. We have wine presses and corking machines for rent. The wine bar is always OPEN. Try wines made from the same wine kits you can purchase in the store. Stop by for a Free Winetasting! 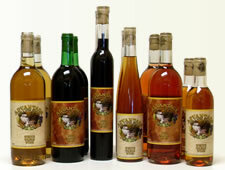 Advantage is also a winery making and bottling the same wine kits that we sell. Come by our store and sample our wide selection. It's a great way to decide which wine kit you'll use in your next project. Thinking about getting started in winemaking? A winemaking equipment kit is a great way to get everything you need? Click here for information that will help you make your decision. Thinking about getting started homebrewing? A homebrewing equipment kit is a great way to get everything you need? The Catawba Lager and Ale Sampling Society (CLASS) meets at Advantage Beer and Wine Supplies every second tuesday of each month at 7:00 p.m. Everyone's welcome. The Catawba Valley Cellar Rats Wine Club meets at Advantage Beer and Wine Supplies every third tuesday of each month at 6:30 p.m. Everyone's welcome.